For its third generation in three years, Apple's mighty little 12-inch MacBook has gotten some updates. But before you ask, yes, it's still got just that one USB-C port. Despite that, this remains one of my favorite current laptops, and this third-generation version fixes one of the major complaints that I, and many other people, had about it. No, it's not the premium price or limited ports. The biggest complaint I heard over and over again about the 12-inch MacBook was that its super-flat keyboard just never felt entirely right. It lacked tactile feedback and the keys were too different from the standard island-style keys found on nearly every other laptop in existence. When the MacBook Pro series adopted a similar flat keyboard last year, it at least had an improved Butterly mechanism (the x-shaped trigger under the individual keys on the keyboard), which made the typing experience feel more substantial, even if some people still preferred the old-style traditional MacBook Pro keyboard. Now the 12-inch MacBook has adopted that improved second-gen butterfly mechanism from the Pro line. Even using it in just a few initial typing sessions, I can totally tell the difference -- there's a click and spring to the keyboard that was lacking before. As someone who has typed hundreds of thousands of words across both previous generations of the 12-inch MacBook, I'm very pleasantly surprised by how good this keyboard feels. Also new is a jump to current-gen Intel processors -- they call this generation Kaby Lake, but it's really the seventh generation of Core-series CPUs. The default is still the Intel Core m3, which is a lower-power chip designed for slim devices that need very long battery life, but that aren't designed for extreme multitasking or very high-end video editing. Frankly, it's fast enough for everyday tasks like writing, web browsing, video streaming and social media. But a big surprise is that low-voltage Core i5 and Core i7 Intel CPUs are now available as (expensive) add-on options. The base 1.2GHz Core m3 model is still $1,299 (£1,249 or AU$1,899), while a 1.3GHz dual-core Intel Core i5 is $1,599 (£1,549 or AU$2,349) and a dual-core Core i7 is $1,749 (£1,684 or AU$2,589). System RAM can now be bumped up from 8GB to 16GB for an extra $200, and Apple says the included SSD storage is now up to 50 percent faster. The extra performance you'll get from the Core i5/Core i7 CPUs options is something we'll have to wait to see in action to properly judge. We're currently testing the Core m3 version of the MacBook and will report on benchmark and battery life results in a future full review. 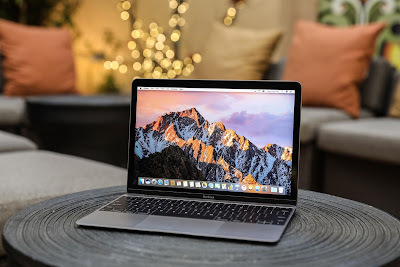 The 12-inch MacBook has remained fairly stable over its three generations, with the same slim 2.03 pound body and high-res Retina display. The improved keyboard and the faster CPU options feel like a real step forward, although the system is still not quite as updated as we'd like. You're still stuck with the same not-great 480p webcam, and there's just that single USB-C port for all your power and connectivity needs, which will be a deal-breaker for many. But if you can work with those limitations, this is the best version of the 12-inch MacBook yet.